I don’t quite get why people think Leonard Cohen’s “Hallelujah” is celebratory — or that it has anything to do with religion. It’s a song about heartbreak. It’s a song about the pain of love. Yes, there’s beauty — in the song, and even in the pain and heartbreak that often accompany love — but mostly this song is just powerfully sad and deeply moving. Something to get hung about…. To this I say: Whatever. John Lennon was a genius — and his human frailties were at the heart of his genius. And I think he was, when the ledger sheet’s assets and debits are balanced, a good-hearted and peaceful man, and a true advocate for that simple but elusive goal: just giving peace a chance. Just think…John Lennon would be 75 years old. He was, incredibly, just 40 when he was gunned down. And, by the way, it’s just not true his post-Beatles work didn’t compare. Chanting the mantra: Peace on Earth. Rest in peace, John Lennon. Who ever would have imagined? Somehow you find yourself in, of all places, Indiana, in a town called Richmond, just over the Ohio line, about midway between Indianapolis and Louisville. You’re heading to breakfast at a downtown cafe and notice a large mural, about two stories high, of a 1920s-vintage blues musician carrying his guitar and his cardboard suitcase. As you wonder about the mural, you wander around the corner and there’s another mural — this one depicts (their names are under the pictures, although you easily recognize a few of the faces) Louis Armstrong, Duke Ellington, Jelly Roll Morton and others. Turns out Richmond, Indiana, calls itself “The Cradle of Recorded Jazz” — and has a legitimate claim to that title. 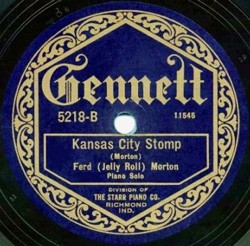 Early in the last century, the town was the home of Gennett Records and Studios, which put out early recordings by Louis Armstrong, Jelly Roll Morton, Duke Ellington, Coleman Hawkins, Fletcher Henderson and Fats Waller. Really early recordings. The last commercial record released with the Gennett label came out in 1934. I didn’t get a chance to stop by the town’s Starr-Gennett Galley, which displays artifacts and memorabilia and offers CDs of music by the label’s musicians. I didn’t have the opportunity to visit the Gennett Records Walk of Fame. But I did visit the brick ruins of the former site of Gennett Records and the Starr Piano Company — Gennett was a division of Starr, which was famous in its own right and was founded way back in 1872 in Richmond. And as I tried to imagine the days when the place bustled with activity and reverberated with music, I also tried to get my head around the impressive roster of Gennett musicians — including Bix Beiderbecke and The Wolverines, Gene Autry, Big Bill Broonzy, blues diva Alberta Hunter, King Oliver, Lawrence Welk (yikes!) Hoagy Carmichael, country/bluegrass legend Uncle Dave Macon, and — holy moley and hosannah! — Blind Lemon Jefferson and Charley Patton! Ray Davies wrote “I Go to Sleep” for the Kinks, years before he fell in love with the lead singer of The Pretenders. Here’s the version by Chrissie Hynde…They haven’t been together for a long time…Are they able to sleep at night now? Or do they still hear this song in their heads, in the darkness, in the night? Nicholas DiGiovanni likes ukulele music. True, believe it or not. Earlier this summer I found myself on the lower East Side of Manhattan in a cozy little venue called Googie’s for an evening of ukulele music, including a great performance by Emmy-award winner J. Walter Hawkes, a friend I met early this year at the Virginia Center for the Creative Arts, where Walter did me the great honor of collaborating with me in a public performance for VCCA fellows as I read one night from a couple of my fictions and was accompanied by the talented Mister Hawkes on his very bluesy and very jazzy trombone. No, I did not have a nervous breakdown after two hours of listening to Walter (performing solo) and two other groups of ukulele virtuosos. It was fun, creative music with more complexity and nuance than you might think.